Saltwater intrusion through the coastal rivers is threating the groundwater aquifers of the southwest coast of Bangladesh. 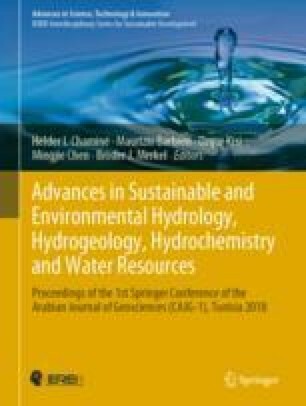 This paper comprises the simulation and assessment of groundwater movement and salinity transportation in the southwest coastal aquifer of Bangladesh. A groundwater model was developed, through the porous medium of the aquifer for a range of existing and possible future conditions. This groundwater model was developed by comprising the model setup and flow properties, and by assigning boundary conditions. The development model was accomplished using GIS, Surfer 13 and Visual MODFLOW Flex. After developing the numerical model for a time period of 10 years, the concentration of salinity in groundwater was found to have increased at a very slow rate due to the intrusion of saline water from the river water.